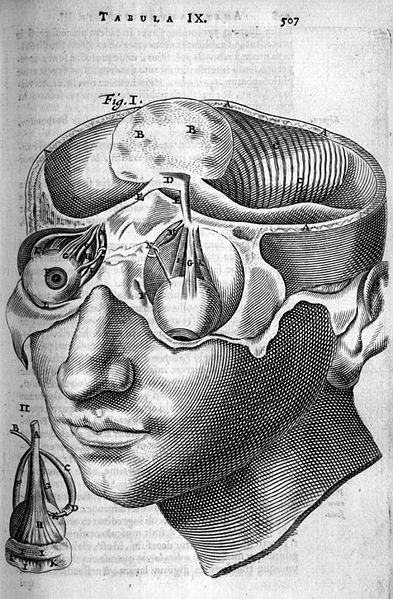 This is how people looked at the brain in 1673. Sketch by Thomas Bartholin, 1616-1680. Image via Wikimedia Commons. Public domain in USA. In early October, the Allen Institute for Brain Science dropped a metric buttload of brain data into the public domain. Towards that end, researchers at the Allen Institute have been mapping gene expression patterns in the human and mouse brains, as well as neural connectivity in the mouse brain. Why? Well, because as a general rule, science requires a control. If scientists are ever to understand the brain – how we think, how we learn, how we remember things, and how all those processes get scrambled during disease or trauma – they first must understand what a typical baseline brain looks like. 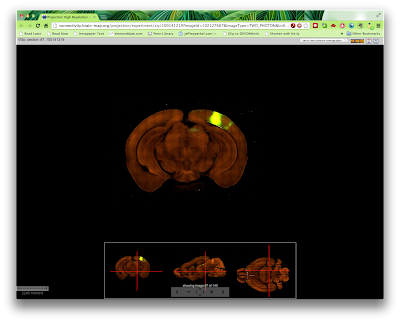 The Allen Institute is doing the heavy lifting of mapping out these datasets, one brain slice at a time. In particular, they are mapping the gene expression and neural connectivity of every part of the brain, so that researchers can identify difference between regions, as well as the physical links that tie them together. Differences in gene expression patterns may reveal, for instance, that seemingly related regions actually have different functions, while connectivity, or brain "wiring," could shed light on how the brain works. I'm a technology nut, so I'm less interested in the answers to these questions than in how we arrive at them. And thanks to the Allen Institute, I (and you) can view these data from the luxury of my very own laptop, no special equipment required. (To be clear, you can't view the data from my laptop. You'd need my computer, and you can't have it.) You don’t even need to be a brainiac (I couldn’t help myself) to do it. Here’s how. Point your browser to http://www.brain-map.org/. From there, choose a dataset – say, “Mouse Connectivity.” This is a dataset of images created by injecting fluorescent tracer molecules into the brains of mice, waiting some period of time, then sacrificing the mice, cutting their brains into thin slices -- picture an extremely advanced deli slicer -- and taking pictures of each one to see where the tracer material went. The result is a massive collection of images, collected by injecting hundreds of mice, preparing thousands of brain slices, and represents gigabytes upon gigabytes of data, which Allen Institute researchers have then reconstructed into a kind of virtual 3D brain. Each human brain contains an estimated 100 billion neurons connected through 100 thousand miles of axons and between a hundred trillion to one quadrillion synaptic connections (there are only an estimated 100–400 billion stars in the Milky Way galaxy). Efforts are currently underway to map the connectome at a number of levels, from the relatively coarse resolution of diffusion MRI to the subcellular level of electron microscopy. That's a story for another day, but if you’re interested in this topic, I highly recommend Sebastian Seung’s eminently readable 2012 book, Connectome: How the Brain’s Wiring Makes Us Who We Are. Back to the Allen Institute datasets. When you click on 'Mouse Connectivity', the site presents you with an index of injection sites, 47 in all. Let’s click on “visual areas.” The next page that comes up is a list of datasets that include that region. For the sake of this example, let’s click on the first entry in that list, “Primary visual area,” experiment #100141219. The resulting page contains 140 fluorescent images of brain tissue slices in shades of orange and green. Click one to see it enlarged. Orange areas are non-fluorescent – they didn’t take up the tracer, meaning they are not physically connected to the injection site. On the bottom of the window is a series of navigation tools – you can tiptoe through the thalamus if you’d like, simply by moving these sliders left-right, up-down, and front-back. Just like a real neuroscientist! This is your brain (well, a mouse brain) on rAAV (a fluorescent tracer). You can also zoom in to the cellular level. Here’s a close-up of a densely fluorescent area of the mouse brain -- you can actually see individual neurons in this view. 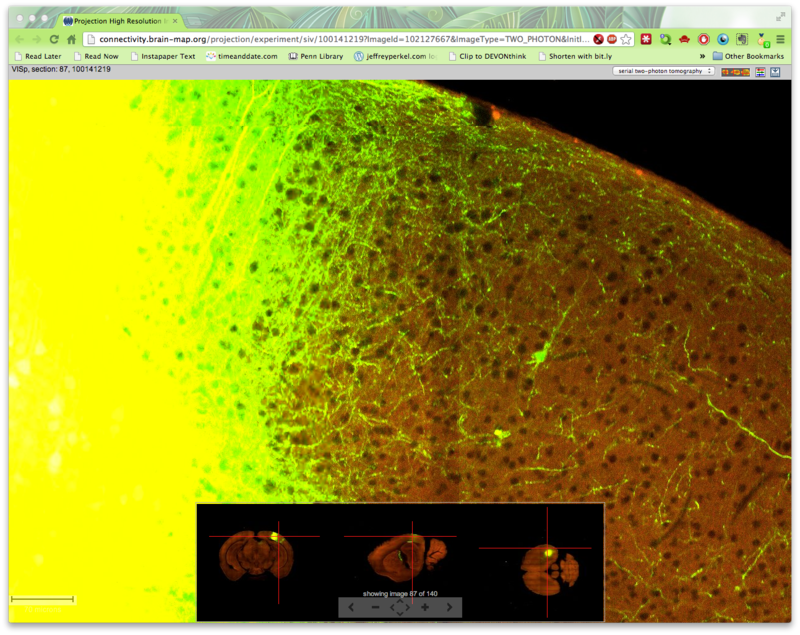 Another option is to download the Allen Institute’s free Brain Explorer software, a standalone program that lets you view these data offline. 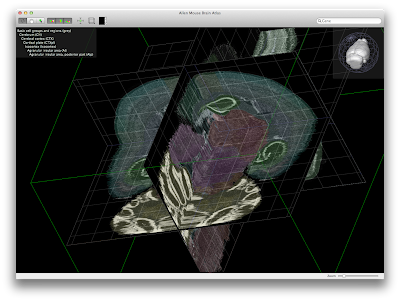 With Brain Explorer you can "step" through the brain slice by slice, rotate it, highlight regions. It's way cool, even if (like me) you don't know very much about brain anatomy. 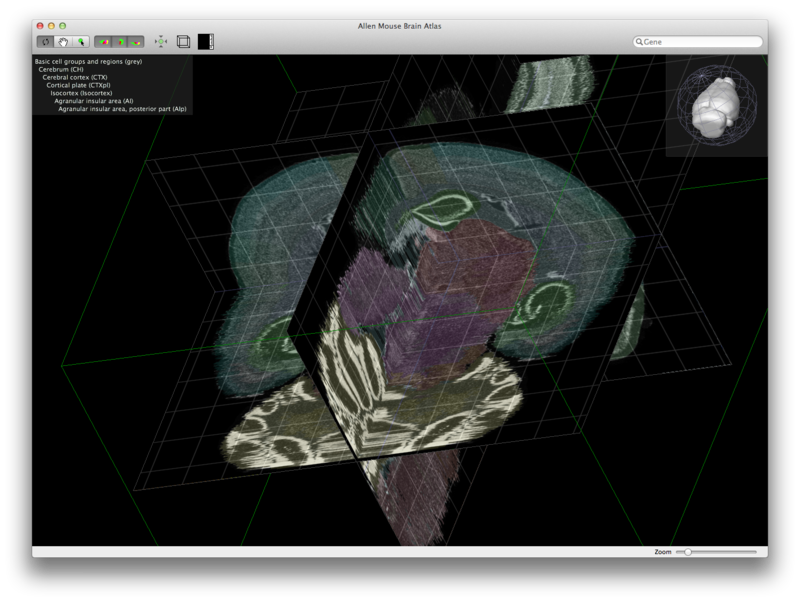 Here’s a screenshot from the application, showing gene expression data in the center of the brain. If you’re interested in how the amazing researchers at the Allen Institute are doing this work, they lay it out for you in a nice series of white papers (here’s the one on the mouse connectivity mapping project). I recommend you take a look! The opinions expressed in this post do not necessarily reflect or conflict with those of the DXS editorial team or contributors.